Matches are a common household item, but our relationship to what they produce when struck fire is a long and complex one. The heat that fire generates warms us, provides light and beckons us closer even as, at the back of our heads, we know of a flame’s destructive possibilities. It is this dual nature of fire that Henderson taps into with the deceptively simple video installation The Known Effects of Lightning on the Body (2014), a welcome addition to the history of matches’ use in art as a metaphor for the human condition, from Ben Vautier’s anarchic Total Art Matchbox to Al Hansen’s precarious matchstick sculptures to Barbara Kruger’s polemic matchbook covers. 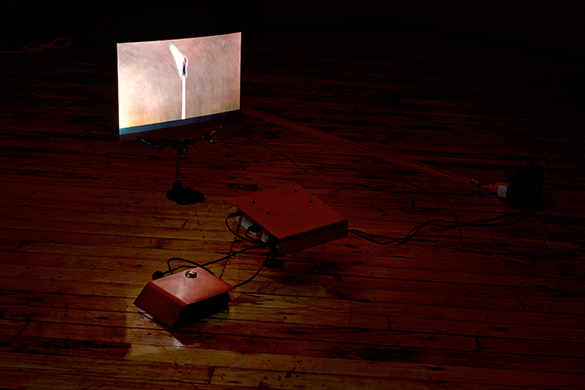 Henderson’s installation consists of three low benches, a single bare light bulb hanging from the ceiling, gallery walls that have been painted red, and a small video projector and screen on the floor. Visitors are invited to sit on the benches and watch a looped video of one wooden match lighting another, over and over. The atmosphere is like that of being curled up before a fireplace or huddled around a campfire. Because we have been made conscious of our physicality within the space by having to lower ourselves almost to the floor, it becomes easy to make the leap to anthropomorphizing the matches on the screen. (The title of the piece, of course, also prompts this reading.) As the match heads spark and begin to burn, we think of the matches as little beings: some resist the flames and burn briefly; others crackle all the way down, gracefully bending in an arc but remaining intact as they blacken; and a few others fall to ashes. It’s as if each match has a distinct personality, with some being more resilient than others. The use of a rectangle of burnished copper for the screen imbues the projection with the look of a chiaroscuro painting. The Zen-like sparseness of the installation’s set-up turns the gallery into a tranquil space for self-reflection. We begin to think about how we react to situations when we feel under fire. Are we able to stand the heat, or are we more likely to burn out? Known Effects expands on some of the artist’s earlier work, such as the haunting photographic series glare (2006-07) in which he created portraits of people using the light produced by the number of candles matching their age. With such works, including Known Effects, Henderson sensitively produces meditations on life, mortality and what it means to be human. Lee Henderson’s The Known Effects of Lightning on the Body is on view in the group exhibition Folklore and Other Panics at The Rooms in St. John’s, which opens January 30, 2015.